Hundreds of protein products claim that they provide the best source of protein. How would Dymatize’s ISO-100 compare to similar products? We put ISO-100 to the test to find out. Dymatize is one of the more-recognizable brands in the supplement industry. With a history of satisfied customers spanning over a decade, it’s hard to think that Dymatize would ever have an unsatisfactory product. ISO-100 is Dymatize’s brand that claims to contain 100% hydrolyzed whey isolates, which is probably where it got its name from. The science behind ISO-100 rests within its hydrolyzed whey isolates, which is believed to digest faster than other whey isolates and concentrates. Dymatize ISO-100’s hydrolyzed whey isolates are a complete contrast from a trend in whey protein powders which are designed for sustained release. Basically, sustained release whey proteins contain different types of proteins that break down differently, resulting in a longer period of protein enhancement. Following that idea, it would be safe to conclude that Dymatize’s ISO-100’s hydrolyzed whey isolates are absorbed faster, but the effects do not last as much as the sustained release whey proteins. Would hydrolyzed whey isolates fare better than sustained release whey proteins? In this review, we’ll take a closer look at Dymatize ISO-100 and see how it fares against other whey protein products in the market today. As with most protein powders, there’s no definitive way of measuring the effectiveness of the product, since other factors like exercise, diet, and lifestyle would influence muscle development. There would be no way to pinpoint if it’s the powder that made progress possible, or was it a change in lifestyle or diet. Test results are always subjective, and the results may not be the same for everyone. On paper, Dymatize ISO-100 looks ok. However, the lack of nutrients that stimulate muscle mass development are not included in the mix. Dymatize ISO-100 would have made a stronger contender in the protein supplement market if there’s something in the ingredient list that would boost energy levels or an increase in testosterone levels – but there’s none. All it does is give protein, a protein which is very abundant in everyone’s diet. There are no immediate effects to tell you if the product actually does something for your body, or if it’s just a placebo effect – making you think that the product contains something that would help you build muscle, but altogether it’s just milk mixed with other weird flavors. According to studies, whey protein isolates can be absorbed and processed by the body in as fast as 40 minutes. This means that you have the most benefit during workout, and very little benefit after working out. You just have it for a few minutes, and then your body throws all of unused proteins to waste. Sustained release proteins act differently, and users would have continued progress long after the workout is done. Studies show that muscle recovery takes hours, and having a 100% hydrolyzed whey protein isolate that absorbs and acts very fast would most likely have its effects nullified after just a few hours. This is a very useful protein that Dymatize ISO-100 does not have. Putting the science of protein synthesis aside, people who have tried Dymatize ISO-100 said that ISO-100’s taste is not terrible, but also not remarkable. Dymatize sure did make an effort to mask the bitter taste of hydrolyzed proteins. 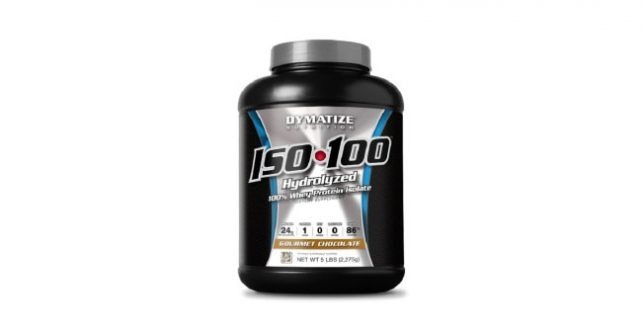 Dymatize ISO-100 comes in a variety of flavors, including: chocolate, vanilla, cookies n’ cream, smooth banana, and piña colada. According to the label, soybean oil is a product of a genetically-modified organism. If you’re cautious about GMOs, check the label first. It would have actually helped if the product had a mix of sustained release proteins and hydrolyzed whey protein isolates to ensure that their customers are getting the best blend of proteins at any given time. According to experts, an appropriate combination would be 66% hydrolyzed whey protein isolates and 33% sustained release proteins.